I’ll have to admit in all of this with Neely, I haven’t spent lots of time talking with my other three about their emotions about Neely’s surgery. I feel like I need help dealing with my own. I guess partly because they seem just fine….squeaky wheel gets the grease thing, huh? I’ve realized now that there is more going on in their little heads and hearts than I could possibly imagine. Ethan is just in love with Neely. He wants to sing to her, talk to her, sit close to her seat…. I think if there was more he could do for her, he would. 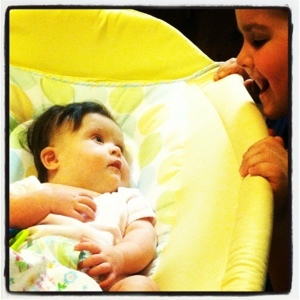 He is so precious and gentle when it comes to his tiniest sister. Yesterday, Ethan told me that he dreamed Neely died…. I told him that Neely was going to be just fine, that she wasn’t going to die. I guess I’m not the only one that needs to hear those words over and over. Praying that my precious little ones know that we serve a mighty God, one that loves us more than we can ever possibly imagine.